Monolithic bullets, all-copper or copper alloy, prevent lead contamination and also perform excellently on big game. Barnes, Hornady and Nosler now make them, and the new Barnes’ Tipped Triple Shock X seems to have it all: near match accuracy, high ballistic coefficient, dependable mushrooming, and the jacket can’t separate from the core because it’s all solid copper. Randi and Coni Brooks bought the Barnes Bullet Company in 1974. They came out with the all-copper, hollow point “X” bullet in 1989, long before there were even hints that bullets containing lead might be restricted. The original idea was that the bullets would absolutely hold together, an engineering challenge for jacketed lead bullets fired from high-velocity cartridges. The fact that the X penetrates with 100 percent of its original weight is an often overlooked advantage. But all was not rosy with the X early on. Copper fouling in barrels could be severe, and accuracy was less than desired in some rifles. The bullet’s long bearing shank and rigid body could raise pressures. The hollow point was very effective, but hollow points had been out of vogue in big-game bullets for many years. The Brooks improved their X bullet by putting multiple grooves around the body of the bullet, which relieved pressure and enhanced accuracy. It is called the Triple Shock X (or TSX). The newer Tipped Triple Shock X (or TTSX) also has a blue plastic ballistic tip. Copper being lighter than lead, the all-copper bullets are slightly longer than conventional bullets of the same caliber and weight. So Barnes has also developed the MRX, which has a heavy, denser-than-lead rear core to make an equal-weight bullet that is a bit shorter. All of the X bullets penetrate with their full initial weight (save for the plastic tips). This means that one can get penetration equivalent to a heavier jacketed lead bullet that loses significant weight on entry, and muzzle velocities with the lighter bullets are considerably higher. Another under appreciated advantage of the monolithic big-game bullet, relating to its absolute guarantee of holding together, is its effectiveness in smaller-diameter, higher-velocity cartridges such as .243 and .25-06. Smaller diameter conventional bullets at screaming velocities can be especially difficult to design so as to hold together on impact with bone and tough tissue. While premium name-brand bullets in general were originally offered for handloading only, these days they are loaded by all of the major ammo companies. Federal offers a broad lineup of various Barnes bullets, as does Black Hills, Cor-Bon and Weatherby. Before the all-copper bullets came along, the jacketed lead Nosler Partition was the most popular bullet for guaranteed performance on big game. The jacket is built like the letter H, with lead inserted both front and rear. The Partition, along with the Bitterroot Bonded Core, the Barnes originals, Trophy Bonded, and a couple of other small-volume custom bullets brought many a hunter into handloading—not a bad thing. Nosler later developed their Ballistic Tip to be the most devastating deer and antelope bullet on the planet. Their 2010 catalog boldly suggests uses for their bullets, and, if I am reading between the lines correctly, the omission of recommendations for the Ballistic Tip for game larger than deer is quite interesting. In bold print, they instead recommend their Partition, within reason, for any larger game. The next page recommends their AccuBond for deer, moose and African game. The next page explains in large print that the Ballistic Tip is recommended for deer and antelope, a recommendation that does not include elk or moose. Not everyone agrees. Just last evening, I watched a TV hunting show in which a hunter described taking a trophy moose using a .338 Magnum loaded with 185-grain Winchester Ballistic Silvertips (Nosler Ballistic Tips). Agreeing with Nosler’s recommendations, I would have chosen a tougher bullet, or at least the heaviest Ballistic Silvertip I could handload in the .338. On the other hand, the big bull dropped where it stood, and most hunters prefer broadside lung shots where a Ballistic Tip or even a heavy varmint bullet should get the job done. Winchester publishes a bullet/game guide with four categories. One is for varmints. Two is for light, thin-skinned big game (deer, antelope and black bear). Three is for large heavy game (elk, moose, brown bear, caribou and eland). Four is for dangerous African game. Many of their big-game loads are in category two. Walt Berger has taken a different tack, with lightly constructed big-game bullets that are dependably effective even though they may shed 40 to 85 percent of their weight during penetration. Walt, a member of the Benchrest Hall of Fame, has long made and sold a line of top-quality benchrest bullets. The line now includes varmint, big-game and tactical bullets, both conventional and VLD. VLD is the acronym for very low drag, achieved with a long, tapered nose or extra weight. Berger’s hunting bullets are relatively “soft,” but a bit different. While other soft big-game bullets expand so quickly much of their hydraulic shock occurs right at the surface, Berger’s hunting bullets are designed to get a couple of inches inside the vitals before violent expansion begins. Results are well documented. In general, the heavier the bullet in any given caliber or diameter, the more energy it retains to keep pushing through the air and maintain velocity, and the deeper it penetrates once it strikes game. This is referred to as sectional density. A properly shaped bullet nose and a sharp point lessen resistance to the air, and the bullet flies faster, longer. Shape, weight and diameter together determine a bullet’s Ballistic Coefficient, and BC best predicts flight performance as a bullet travels downrange. Nowadays, a bullet’s terminal mushrooming performance can be engineered regardless of point shape, making sleek, nicely pointed bullets with high BCs the obvious choice for flat long-range trajectory and punch. Typically heavy hunting bullets, 160 grains in .270 and 220 grains in the .30s, work just fine if well-shaped. Any heavier, and they would be too long to stabilize in most hunting rifle barrels. Rifles with faster rifling twist to accommodate super-heavy bullets started appearing in long-range target competition a few years ago, and we now see them shooting Berger’s big-game bullets. How about hunting elk with a 180-grain bullet in 7 millimeter, one having an incredible BC of .659? OK, but the barrel rifling must have a faster twist. Even within typical bullet weights, we can get a higher ballistic coefficient if we make the point longer and more slender. But these VLD bullets are also very long and also need a faster rifling twist. A couple of years ago, Barnes, guided by military technology, introduced a new idea in varmint bullets. Predator hunters have always wanted fast, flat-shooting bullets for distant shots, but velocity tends to blow a large exit hole in a pelt, degrading the fur value. To answer this challenge, Barnes made a bullet core out of copper and tin powder, so tightly compressed it acts like solid metal—until it hits something. Then it just disintegrates. Aptly called the Varmint Grenade, it is available in .224 and .243. I’ve taken several woodchucks with the bullets, and none has exited. I believe Black Hills may be the only source for factory-loaded ammo topped with Grenades. 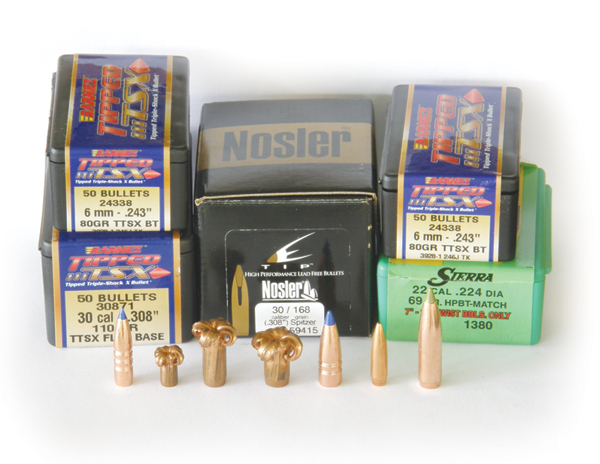 They also offer a Multi-Purpose Green lead-free bullet in .224, 6.8, .308 and 7.622x39. And new this year are Barnes Busters, heavyweight, heavily jacketed hunting handgun bullets for deep penetration, available in .44, .45 and .500. Barnes TTSX also offers the possibility of going the other direction in hunting bullets, with very lightweight big-game bullets that retain 100 percent of their weight for deep penetration. In .308, they offer a 125-grain hunting bullet, and more recently, a 110-grain, which I hope to use this fall in a .309 JDJ carbine. I used a 120-grain Barnes TTSX in an Ultra Light Arms .284 last season, and I’ll try a 110-grain in that rifle this fall. Paying extra for a premium bullet to better guarantee performance, especially when using cartridges at the fringe of their common-sense suggested use, can be a wise investment. And nowadays, which bullet is pretty much up to you.